Instant Apple Pie? A dessert that is deceptively simple to make in 15 minutes. This is one of my mystery bag challenge given by one of the famous Master Chef New Zealand Winner - Nadia Lim. There are 4 items in this mystery bag - Breadcrumbs, NZ apple juice, Waferbites and salmon. The challenger must choose 2 items from this box to prepare a dish, also can use any ingredients from my own pantry to bring this dish to life. Due to my late delivery of salmon, I've already prepared this dessert which is my own new creation. Well think outside the box, "Fogdog" brand premium Panko breadcrumbs and "Mill Orchard" premium NZ apple juice will be my hero in my dish - Instant Apple Pie Parfait. Well, my first thought is " how can I combine these 2 hero products together? If making apple pie, nothing so special? What about make something quick, easy, no baking required at all dish? "All these sprung in my mind, out of sudden thinking what do I have in my pantry which is available straightaway without a need to go for shopping. Open my fridge, whip cream!!! 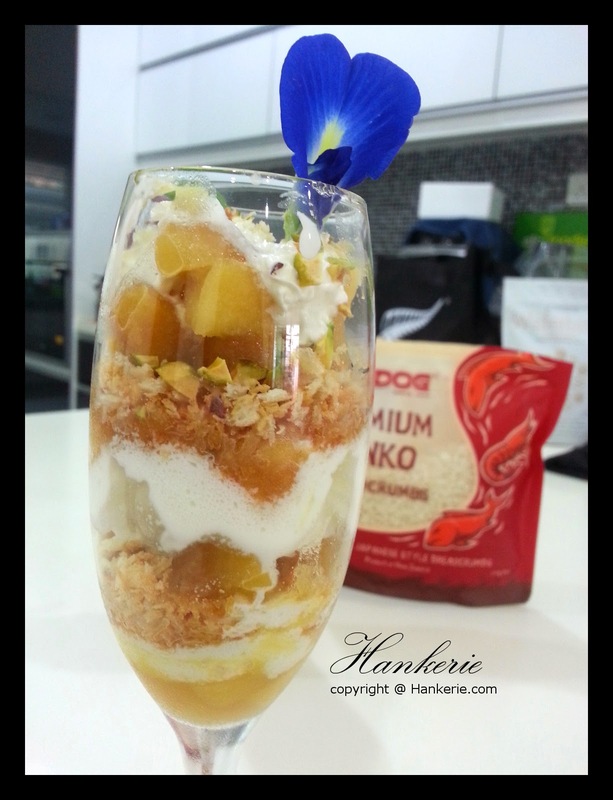 There comes my idea - transform the hot apple pie to instant cold apple pie parfait. In fact, I never make any parfait before but I saw a lot of French and American make this a lot. In French, Parfait means "Perfect". 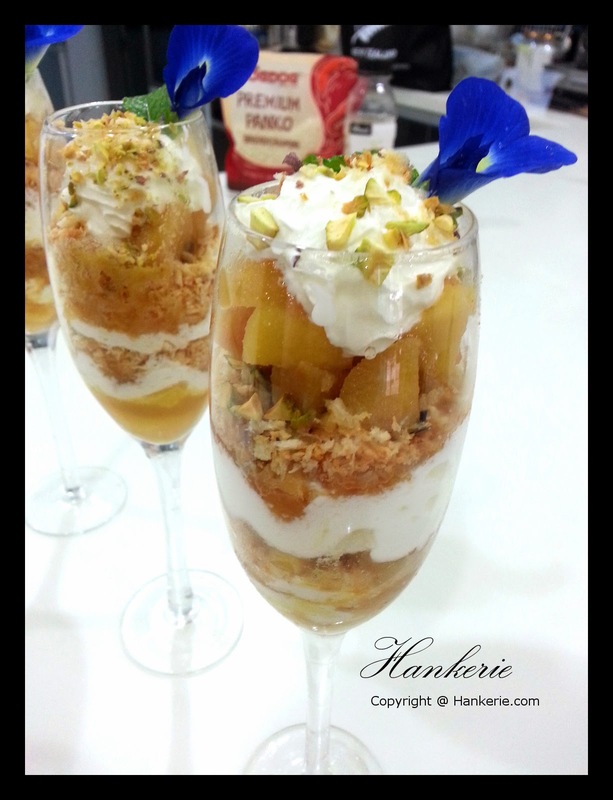 It is a kind of layered frozen dessert serving in tall glass, and I serve them in my long champagne glass. 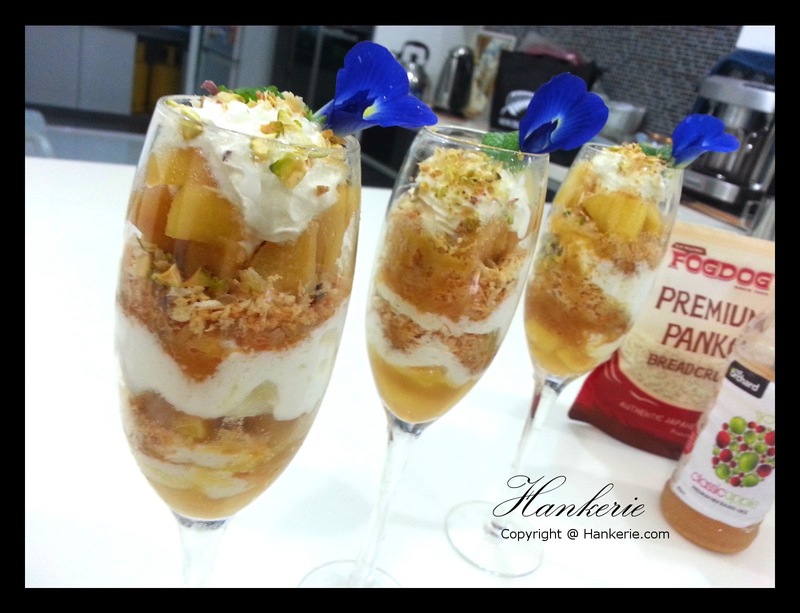 The taste of this instant apple pie parfait exactly like the apple pie taste. The breadcrumbs in fact can substitute the apple pie crust that require so much time to prepare. What you need to do is just pan fried the breadcrumbs, that is!!! So much effort saved. Mix them with some nice pistachio to add on the crunch when serving. About the apple juice hero, I am using it to cook with my apple cubes. 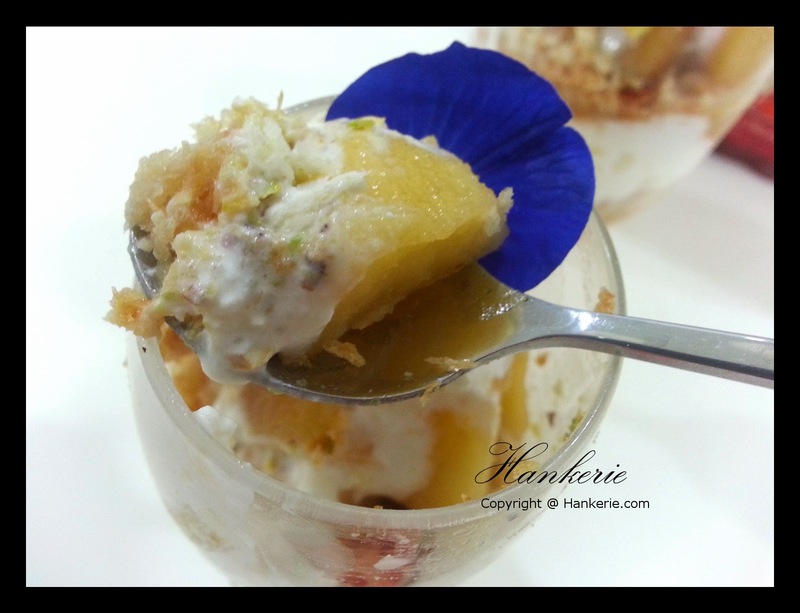 With that I can reduce a lot of sugar level when caramelise the apple cubes. It is the healthier option to use apple juice which has the natural glucose in it for helping the caramelisation process. 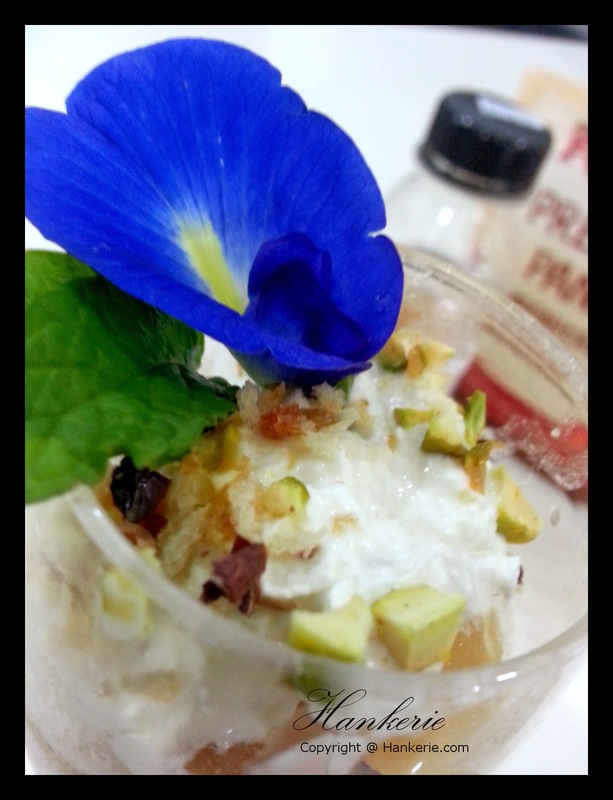 These 2 products indeed my hero in preparing this super fast prep time dessert. For dairy-free or healthier option, you may substitute the whipped cream with natural yogurt in layering this parfait. Best option for after meal dessert and even breakfast. Prepare them and keep it in fridge. Pan fried breadcrumbs with small heat until crispy brown. (without any oil) Set aside and let it cold. Peel the apples. Cut them into cubes. Heat up the frying pan. Toss the apple cubes with salted butter. Add on the apple juices in medium heat. If the apple appear dry, you may add on more apple juices. Add on the brown sugar and cinnamon powder. You may opt out the cinnamon powder if you do not like it. Once the apple cubes are caramelised, set aside and let it cold completely. Prepare 3 champagne glasses, layer apple juice at the bottom, apple cubes, whipped cream, breadcrumbs, pistachio, apple cubes, whipped cream, breadcrumbs, apple cubes, whipped cream, pistachio. Decorate it with blue pea flower and mint leaves. Serve it as desired. Hi! I just want to give you a big thumbs up for your great info you have got right here on this post.